A swimming snorkel allows you to breathe without moving your head. When most people think of a swimming snorkel, they think of the ones used by scuba divers and divers. 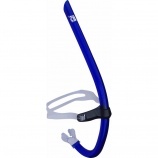 While this is one of the most widely acceptable uses of snorkels, the use of the Swim Stuff Pro Team swim snorkel, for example, can help you train better so you can improve your performance in the water. Understanding how this tool can improve your stroke and the rest of your technique will show you the value of investing in a good swimming snorkel. Swimmers need to be able to breathe while they swim or they won’t last long in the water. However, when you turn your head to the side, you can quickly disrupt your stroke and lose some of your efficiency, especially when you are first starting out. This can make it difficult to develop a good rhythm and to work on perfecting your stroke and other techniques. Because of the importance of proper breathing, this can put a damper on your swimming technique. One of the primary benefits of using the Swim Stuff Pro Team swim snorkel in your training is you eliminate the need to move your head side-t0-side as you swim. This allows you to focus primarily on your stroke and other elements of your technique while breathing easily. While it takes practice to learn to breathe through a swimming snorkel more efficiently, it is well worth it to give you the chance to perfect your stroke. When you’re working on improving your performance in the water, it’s often best to focus on one thing at a time. Using a swimming snorkel allows you to focus on specific areas of your swimming technique without worrying about performing the right motions to breathe. This can improve your performance in the water once you put everything together. Working on your stroke and other swim techniques is important if you want to perform your best in the water. The Swim Stuff Pro Team swim snorkel can help you focus on improving your techniques and then implement the breathing into your swimming so you can become more powerful. If you are interested in buying this swimming snorkel or any other swim training product, contact us. DJSports.com offers a full selection of everything you need to become a better swimmer and improve your chances of winning.